Spanner in the Workz: Discoveries Aplenty but Geology Exhibition needs to Dig Deeper! Discoveries Aplenty but Geology Exhibition needs to Dig Deeper! 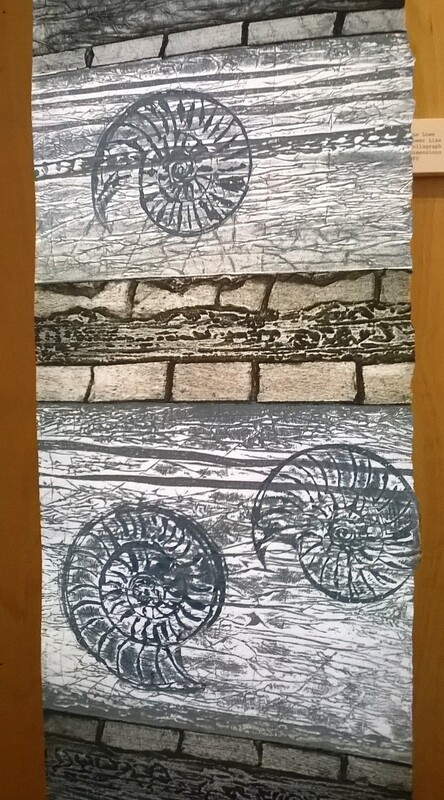 ‘Marking Time’ continues where it left off in 2015 as the, culmination of a 2-year creative development project in which six local artists [they are; Alison Jacobs, Melanie Deegan, Sue Lowe, Angie Wood, Lucy Lean and Andy Davey] have met regularly, ‘braving the mud and tides to explore the full extent of the beaches and coast around Watchet’...and learning more about the processes such as erosion and weathering that formed the coastline to inform and inspire their work. 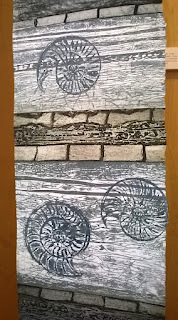 Looking at fossils, ‘fossil tourism’, geology, mapping and woollen manufacture the exhibition featured an array of practices from print-making, casting, painting and drawing to paper-folding, hand-spun yarn and more. The strength of this exhibition was in fact that there were so many different components to look it. 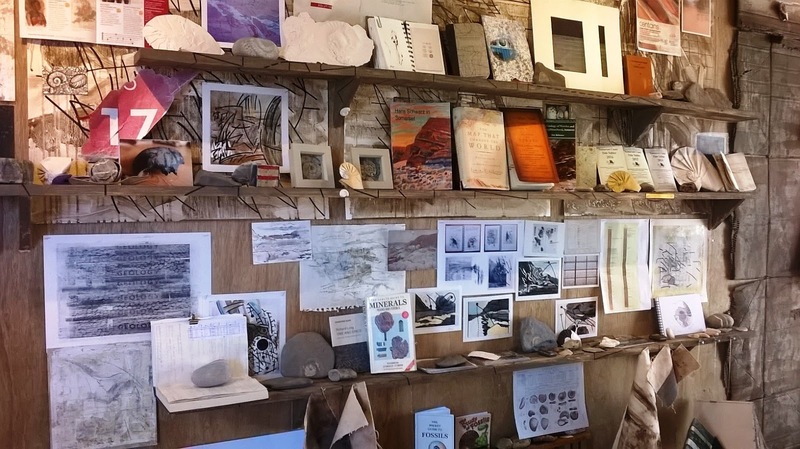 The shipping-container space that is Contains Art, became a walk-in cabinet of curiosities with not only the works produced by the artists on display, but arguably in some cases more interestingly, the books, sketches, maps, paraphernalia and fossils themselves collected as part of their research (pictured). I am a firm believer that the ‘research itself’ if done well enough can become the ‘art’ itself and unfortunately there aren’t enough occasions when one actually sees this exhibited in Somerset; I loved looking at the books, fossils, sketchbooks and curiosities displayed on shelves within this exhibition. It said a lot about the interest, passion and depths to which the group of artists had researched geology and the coastline of the surrounding area. In-turn the connection this research had to some of the individual artist’s responses was clear. they do so in little depth and so in some ways feel more aesthetically pleasing or obvious rather than really exploring much deeper. Or in some ways they feel so personal to the artists who made them that it is hard for the viewer to get anything else from the work. 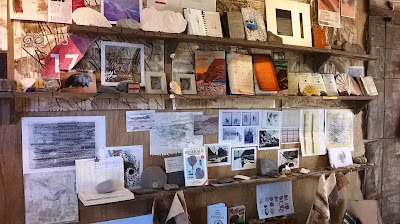 Some of the colours, ideas and processes that inform the work could have been developed further to create work that was either more site-specific or referenced ideas of geology, weathering and erosion found in other places. 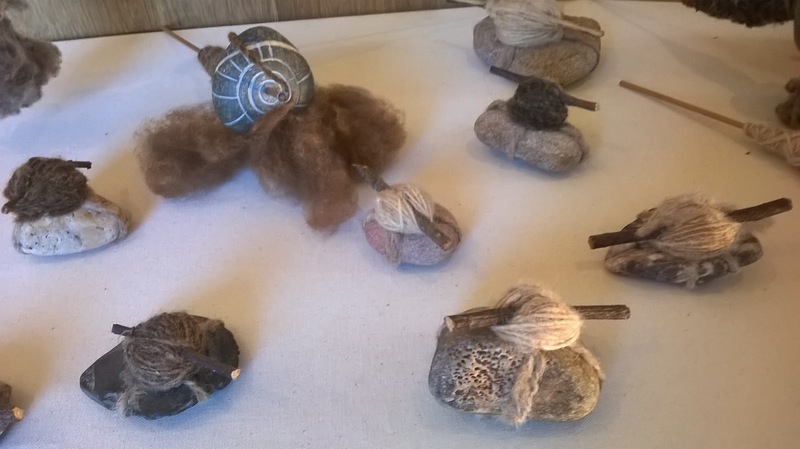 Elsewhere this is more evident, Lucy Lean spins yarn using local rocks as spinning whorls, her work exploring the human-response to the ancient local trade. She is looking at the primordial nature of ancient processes and human connections with the materials found in a place. The pieces made from this yarn are tactile, totemic, of-the-hand; their yarn having symbolic connections to the passing/threads of time. It makes you think about the physical passing of time and I personally like that it is less direct making the viewer relate the concept of time to the human relationship to craft and the land. It’s enjoyably unexpected. 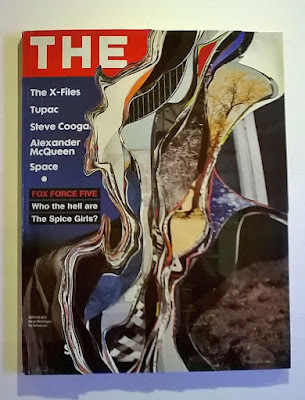 My favourite pieces from this exhibition however being Alison Jacob’s ‘Face’ magazines (pictured) in which she has cut the pages in coastline-like waves to create coloured layers that recede mimicking the geological layers on a map. I like the way these works take a modern and existing object and apply a geological idea to it; the magazine and its cultural history being excavated as stone and soil is -all we see being fragments and glimpses of past histories rather than the 'full-picture'. It brings, like Lucy’s work, a human-element to it that makes it more relatable and suggests the passing of time. Here we have something that was once disposable now being considered as a typological object; it had me thinking of other places we can find other ‘geological’ processes such as layers in billboard, peeling wallpaper, weathered or buried surfaces etc. 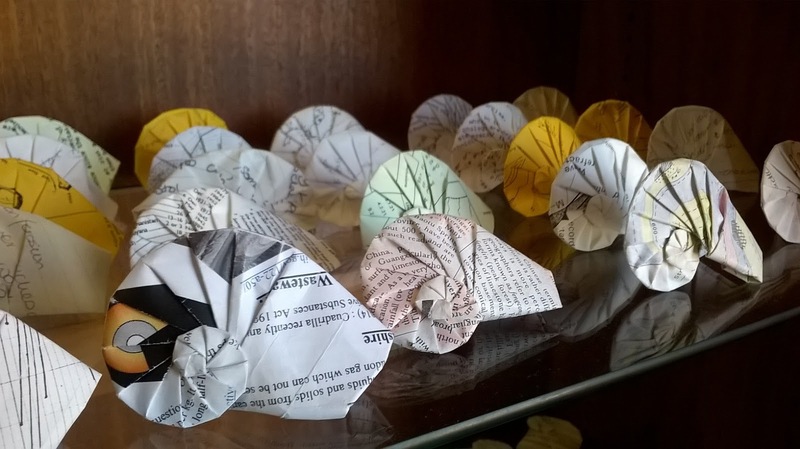 In another paper-based piece Alison has transformed her Geography degree notes into a sea of origami ammonites (pictured) that neatly line the top shelves of a museum-like display cabinet like precious specimens before spilling out into a disorganised heap on the floor. It’s a thoughtful transgression of our relationship to studying and the paper it accumulates from being highly valued to lining the floors of many a student bedroom. They make you smile and are surprisingly interesting each individually as well as making up the bigger whole. ‘Marking Time’ achieves much and does not disappoint in the breadth of treasures it contained; it is rewarding too, to see the research and passion of the participating artists displayed as part of the exhibition as a whole. 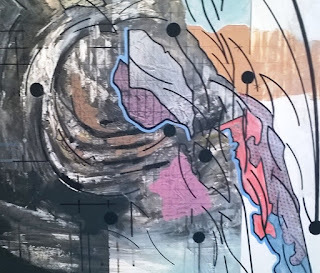 How that research has then manifest itself in some of the work is perhaps where I am more critical, some of it feels a little obvious or would, ironically perhaps benefitted from more time in allowing the ideas in this work to develop. Even so there is much delight to take from the skill and visual and aesthetic appeal of all the work. For the serious fossil hunter (as with the art in this exhibition), finds found deeper in the earth, in the tricky places that may be hardest to reach are often greater as they are rare. ‘Marking Time-Geology 2’ has ended but visit http://www.containsart.co.uk/ for news of more ‘Contains Art’ exhibitions!